Terrorists Fight Each Other in Eastern Aleppo over Diminishing Resources 4.3333333333333 out of 5 based on 9 ratings. 9 user reviews. 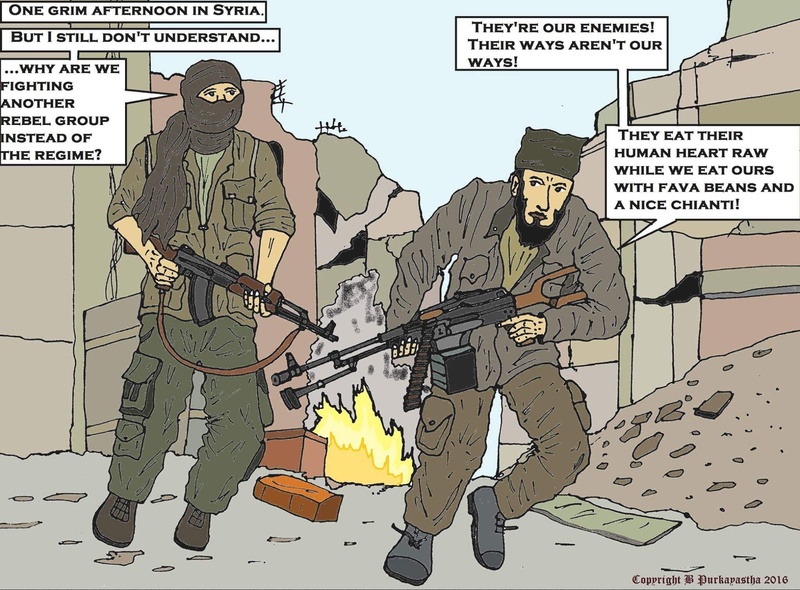 According to militants’ sources, armed ‘moderate’ opposition groups started to fight against each other in order to take control over rapidly diminishing resources in the besieged city. After a failed attempt to break through a military blockade of Syrian troops in eastern Aleppo, armed ‘moderate’ opposition groups started to fight against each other over rapidly diminishing resources, including weapons and advantageous positions in the city. An intense fighting between members of various groups was registered on the western frontier of the eastern side of Aleppo on Thursday, the Syrian Observatory for Human Rights (SOHR), a UK-based watchdog group, reported. A spokesperson for the Nour al-Din al-Zinki Islamist group, which is a part of the Free Syrian Army (FSA), said that militants of the Jabhat Fateh al-Sham (previously known as the Al-Nusra Front), the Abu-Amara Brigade and the Nour al-Din al-Zinki jointly attacked positions of the Fastaqim Kama Umirt group, which itself is also a component of the FSA. He also noted that militants intended to capture positions and weapons, belonging to the Fastaqim, and added that now the warring sides have announced a ceasefire, trying to solve sectarian differences. Last week, the same groups together took part in a massive counter-offensive on positions of the Syrian Army, trying to break through the siege of eastern Aleppo. According to the Russian Defense Ministry, 127 civilians were killed and 254 others were wounded in the ‘bloodbath’ offensive, occurred during the two-week humanitarian pause. The failed offensive became a catastrophe for terrorists. According to Chief of the Main Operations Directorate of the Russian General Staff, Lt. Gen. Sergei Rudskoy, militants lost 80 pickup trucks, equipped with heavy machine guns, 21 battle tanks, 14 mortar crews, 12 bomb-equipped suicide vehicles, ten infantry fighting vehicles, and six rocket artillery systems. On Friday, Russian military announced the beginning of a new 10-hour humanitarian pause in order to ensure the safe evacuation of civilians and unarmed militants from Aleppo. However, armed opposition groups, including the Nour al-Din al-Zinki, which the US considers a moderate group, stated that they are not going to leave the city. During the last pause, militants shelled a humanitarian corridor, located on Aleppo’s Castello road, wounding two Russian servicemen. As the Al-Mayadin TV-channel reported, extremists do not let civilians to escape from the city. This report clarifies something that has been perplexing me for sometime. to become scares unless there was still a way of obtaining resupply. of a siege is to cut off supplies. The illusion of resupply in part also due to high (now diminished) stockpiles of food and ammo? Yes I did also think that there could have been stockpiles. Looks like these are running out! I see here two very goood developments: russian “softnes” and lack of recent SAA attacks meant that the terrorists were allowed a breather and to become overcomfident, and as resault start squabbling over diminishing resources. It was most certainly not something explicitly planned by the russians, but it’s certainly welcome. Sun-Tzu said that one should never interfere with the enemy in process of self-destruction. it was therefore very good that the SAA & Co. had more important work outside Aleppo. And this also neatly explains whey the encircled terrorists were unable to do anything to help the offensive from outside. Bear in mind Russians also like to take care of encirclements in due time, for example at Stalingrad, trap closed around 23 November, but reduction did not take place until middle of January next year (43). Yah, maybe. The source is suspect. The Syrian Observer for Human Rights is a London based propaganda ‘organization’ (a guy with a cell phone) who hasn’t been to Syria in 5 years. There are rumors that he is wanted on criminal charges. He says a lot of stuff…most of it unverifiable or untrue. 80 pickup trucks, 21 battle tanks , 14 mortar crews , 12 suicide units , 6 rocket artillery systems . That was a serious offensive by the jihadists , that was courage and some extraordinary action by the Syrians , and Friends. Hopefully their infighting not only reduced their numbers , but revealed their locations. Let the clean up be swift and sure .